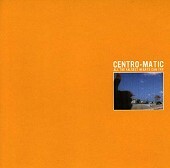 Shaky, heart-on-the-sleeve vocals help define the intimate, yet still rocking combo known as Centro-Matic. The opener, "Cool That You Showed Us How" is a short piano-based lightweight that soon merges into the guitar-heavy rock of "The Blisters May Come". The band, although capable of serving up the rock dishes, and plenty willing too, I might add, are best when they're soft and quiet, but walking with an edge, like on "Huge In Every Town." Here the rock makes an appearance, but the intimate, revealing pop-emo is what the band delves in the most, shedding some skin, and coming out front, instead of hiding behind the guitars. When this is the case, the band not only hooks you in, getting you to sing along, but they have you feeling every moment, too. That's not to say their rock material doesn't live up to this. It does, but instead of sounding revealing, they seem to be pulling back the punches and hiding behind the guitar noise. I'll give this a B.